Need A Quick Gutter Replacement in Washougal? For homes in Washougal, a good rain gutter is the best way to prevent costly water damage. 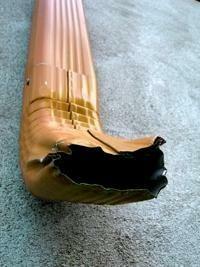 But even the best rain gutters need replacing after several years of the PNW’s worst weather. A properly working gutter should not only weather the storms, but should also filter out any debris a storm piles onto your rooftop while making a clear path away from your home’s foundation. 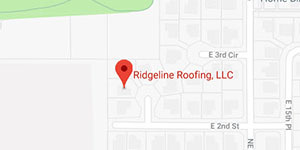 Ridgeline Roofing contractors install and replace a wide range of rain gutters and down spouts that keep fallen leaves and debris out, while creating a path for water to drain properly and freely from the roof and out through the downspout. Sometimes, all that’s required to fix a rain gutter is a glove to scoop out dead leaves. 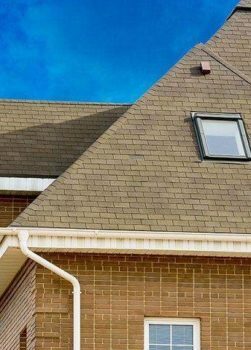 By updating your gutter with new guards, or replacing your entire gutter system, you’ll take a more pro-active approach to your roof drainage system. Clogged gutters are a small but fixable problem. Waiting too long to clean out your gutter can spell bigger problems for your roof in the long run. Roof stains can show up on your shingles when debris backs up from your gutters onto your roof, trapping moisture and mildew underneath. When water and debris is allowed to collect on the roof, this can cause dark stains on roofing shingles that are difficult to remove. Siding damage can occur when gutters leak water onto the siding of your home over time. Water emanating from the gutter directly onto the siding causes water damage, rotting, and other costly structural problems to your home if it’s not immediately addressed. Basement flooding occurs if the downspouts on your gutter system don’t do their job of channeling water away from the foundation. Downspouts empty free-flowing water to a drain the sends water away from the house. Foundation problems are the most expensive fixes to result from a dysfunctional rain gutter system. When rain water collects around the base of a house, the integrity and safety of your home is at risk. Ridgeline Roofing constructs roofs and gutters that last a lifetime for your biggest investment. From complete roofing projects to small fixes on your gutter, we aim to build durable and efficient gutter systems fit for a Pacific Northwest climate. We also install the latest gutter guards and micro mesh to keep out any debris from entering your gutters. We also adjust your downspouts and drainage system to protect your home. To see if replacing your rain gutter system is the right option, give us a call today. Sometimes rain gutters just need patching, replacement parts, or a good-old-fashioned cleaning. Other times, full-scale repairs are in order.